While adapting to a changing climate is important, it’s perhaps even more important that we make a commitment to addressing the root causes of climate change. Scientists agree that many chemical compounds found in the atmosphere act as greenhouse gases. These gases allow sunlight to enter the atmosphere freely. When sunlight strikes the Earth’s surface, some of it is reflected back toward space as infrared radiation — heat. Greenhouse gases absorb this infrared radiation and trap the heat in the atmosphere. Many gases exhibit these greenhouse properties. Some of them occur in nature — water vapor, carbon dioxide, methane and nitrous oxide — while others are exclusively human-made, such as gases used for aerosols. Levels of several important greenhouse gases have increased by about 25 percent since large-scale industrialization began some 150 years ago. During the past 20 years, about three-quarters of human-made carbon dioxide emissions were from burning fossil fuels. Switching to renewable energy is an important strategy for addressing the future trajectory of climate change. Rhode Island has one of the most comprehensive — and best — packages of renewable energy laws in the United States. These laws have been enacted by the General Assembly during the past nine years and have, for the most part, worked out exactly the way they were intended. While it’s true that much more will need to be done if we are to reach our goals of reducing greenhouse gas emissions by 80 percent by 2050, it’s also true that Rhode Island is a national leader in renewable energy. The Renewable Energy Standard (RES) — called “Renewable Portfolio Standard” in some neighboring states — requires utility companies to obtain a certain percentage of their electricity from renewable energy sources. The RES was enacted in June 2004, and the percentage of electricity that must come from renewables increases annually, reaching 16 percent of load by 2019. The mechanism that is used to monitor compliance is an ingenious one. Renewable energy generators get credits for every unit of renewable electricity they generate. These credits are called “renewable energy certificates” (RECs). Utilities show their compliance with the RES by buying enough RECs from renewable energy generators to satisfy the RES obligation year by year. In the event that there are just no RECs available on the market — because not enough renewable energy projects have been built — utilities can satisfy their RES obligation by making a so-called “alternative compliance payment” (ACP) to the state’s Renewable Energy Fund. That money goes toward new renewable energy projects. In the nine years since the RES law was enacted it has worked well. In nearly every year, there were plenty of RECs on the market. Thus, renewable energy project owners actually had two separate streams of income: they sold electricity and they sold RECs. This past year, however, there was a shortage of RECs, so National Grid made an ACP to the Renewable Energy Fund of nearly $5 million. The way the RES law is designed, renewable energy projects are helped when there are RECs to buy, because developers receive a second stream of income, and renewable energy projects are also helped when there are no RECs to buy, because ACP money goes to fund new renewable energy projects. The 2004 RES has worked well, but had one big gap in it. Long-term contracts (LTCs) between a renewable energy developer and a utility are especially important to renewable developers, because LTCs help the developers get bank loans for their projects. Developers can literally “take the LTCs to the bank” and use them to collateralize loans to build their projects. The 2004 RES didn’t require utilities to enter into LTCs, and National Grid was meeting its RES obligation by buying RECs only on the spot market. The General Assembly responded by enacting the LTC Statute in June 2009. That law obligates the utility to buy 90 megawatts of renewable energy with long-term contracts, not on the spot market. These 90 megawatts are in addition to the obligation created in the 2004 statute, and are to be completed over a four-year period. 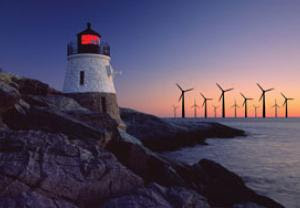 The LTC statute also facilitates construction of two offshore wind projects off the coast of Rhode Island — a 10-megawatt demonstration project off Block Island and a possible, and much larger, 150-megawatt project further off shore. The 2009 statute differs from the 2004 statute in one other important way: the RES statute mandates the buying of RECs; the LTC statute mandates the buying of a so-called “bundled commodity” that includes both electricity and RECs. Net metering occurs when an electric customer’s meter can run not only forward but also backward. Net metering is important to individuals and companies that have small renewable projects, such as solar panels on the roof of a home, because net metering often makes the difference between those projects being economically viable and non-viable. Until 2011, net-metering law in Rhode Island was in shambles. For example, some renewable energy technologies qualified for net metering but, for no apparent reason, others did not; moreover, many portions of the law were so vague — or incoherent — that no one was sure what they meant, and there was even litigation challenging net metering by alleging that the Rhode Island law conflicted with federal law. A new net-metering statute enacted in June 2011 fixed all those problems. The new law makes clear that net metering is available to all renewable technologies; it gives a generous price to renewable energy generators; and outlines exactly the boundaries between Rhode Island and federal law. Large institutions, such as universities, get to offset the electricity usage at an unlimited number of separate meters; and municipalities get to offset meters at disparate locations. For example, by erecting a single wind turbine, a municipality could offset the separate electricity meters at its town hall, fire station, police station, elementary school, middle school, and, say, three high schools. This is one of the most progressive net-metering statutes in the country. The Distributed Generation Standard Contracts statute addresses and fixes an unexpected problem in the 2009 LTC statute. That statute worked well for large companies, such as Deepwater Wind, that wanted to develop and build large projects. But the LTC statute wasn’t so good at helping smaller developers that were unable to afford an army of lawyers to negotiate individual contracts with the utility. The DG statute solved this problem. The statute carves out a portion of the long-term contracting obligation created in the 2009 LTC statute and sets that portion aside just for small, local projects, like a town that wants to put up a single wind mill. In order to prevent the need for that expensive army of lawyers, the DG statute creates a simple, standard contract for developers of small, local renewable energy projects. Basically, the law says: If you have a small, local renewable energy project, you do not need to negotiate your own contract with National Grid; instead you can automatically get a standard, short, easy-to-understand two-page contract. The statute also sets a standard price for such small renewable energy projects — the price is set by a board and is designed to be high enough so that such small projects are economically viable, but low enough so that the public is not forced to overpay for renewable energy. The big, utility-scale projects can still be built; but the DG bill will now make it easier for smaller projects to also be built. In the 15 months since the bill was signed into law, National Grid has held three separate sign-up periods. To date, 18 separate projects have signed up. Each of these 18 projects will be built here in Rhode Island. The proposed projects are in Providence, East Providence, Portsmouth, Lincoln, Westerly, Bristol, West Greenwich, East Greenwich, Hopkinton, Middletown, Cumberland, North Kingstown, North Smithfield and West Warwick.